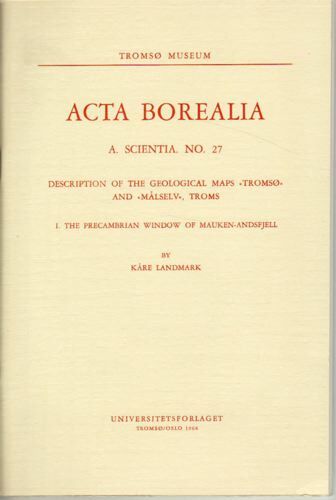 Wangsmo Antikvariat AS - Description of the geological maps Tromsø and Målselv. LANDMARK, KÅRE: Description of the geological maps Tromsø and Målselv. Tittel: Description of the geological maps Tromsø and Målselv. Utgave: Acta Borealia. A. Scientia No. 27. Illustrasjoner: Stort foldekart i mappe bak.